Digital pianos have made huge technical advances over the years. In times past, the digital piano option left musicians wanting more, but the digital options of today have many more advanced options than even traditional pianos. Many of the digital pianos on the market are extremely portable instruments that will never go out of tune. The sounds from a digital piano will produce a beautiful melody that compares to the music heard from the keys of a grand piano. All of the reverb options and the different key tones available can make choosing the best digital piano for you a daunting task. We have done the research, and here are some of the best options available for purchase on the market. The top entry on our list of exceptional digital pianos is created by the legendary instrument creators at Yamaha. The Arius YDP-181 is truly a workhorse when it comes to providing great features for neophyte and experienced piano players alike. The relatively small instrument is easily capable of producing the same elegant sounds that you can get when playing a grand piano. 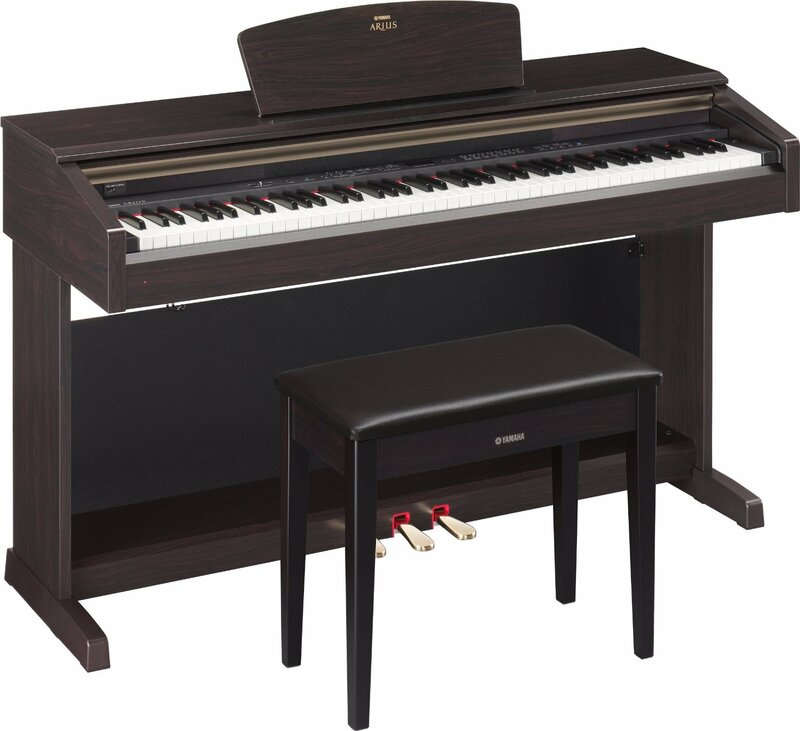 The actual size of this digital piano is about 54 inches wide and 34 inches in height, which makes it a great option for a family room or an area where a grand piano may look out of place. This is not the lightest piano on our list; with the total weight of the instrument reaching 110 pounds, which makes it a slightly less convenient instrument for any type of travel. This 88-key digital piano is the only option on the list that comes with pedals. Pedal functionality may vary for each piano, but this specific one offers three pedal options, which are damper, sostenudo, and soft. The pedal action of the Arius is in-line with American style piano pedals, which may seem a bit more graded than European style pedals. The 88-key graded hammer keyboard is weighted to have a heavier touch on the lower notes and a lighter touch the higher up the musical scale you climb, which makes the instrument feel more like a grand piano. This superlative digital piano comes with an included internal 20 watt amplifier that helps clarify the intonation of the notes, which produces a clear and expressive sound. The speakers are large, powerful devices that resonate and create a greater bass response. These features come together to allow this digital piano to produce the same rich, dynamic sounds that are typically heard on a grand piano. The Advanced Wave Memory (AWM) Sampling System is a digital system that produces a complex sound combination and allows the musician to implement more than one tone into the final musical composition. Yamaha creates the rich sound of this piano by sampling notes from a grand piano. Typically, three notes are sampled that range in intonation and volume, which are forte, mezzo forte, and mezzo strikes. This aspect allows the digital piano to produce an original acoustic sound that has multiple layers of volume expression. This instrument is also capable of producing 128 different notes at the same time, which means sustained notes will no longer be cut off in favor of other notes that have just been pressed. The three song memory recording option of this digital piano allows the user to record a bass line and the harmony as a separate aspect of the piece. It can then be combined into one arrangement as a solo part is added to the final composition. As an added bonus, the Arius has a built-in metronome the will help you keep time with your already recorded music. This piano also has dual voice capability, which allows two different instrument variations to be utilized at the same time. A great sounding dual voice is the combination of piano and strings. Once the entire song is recorded and you are satisfied with the sound you just created, a convenient USB port is available for the ease of saving and transferring your songs to another location. This piano includes a Light Emitting Diode (LED) display that features touch sensitive panel buttons. This allows the musician to set the sensitivity of the keys to hard, medium, or soft to match their specific playing style. A sliding key cover is also a great feature to help keep the keys free from dust and debris. In addition, there is a headphone jack that allows you to focus solely on the music you are creating without any distractions. This Digital piano comes with 50 preset piano songs that can be used as a means to learn the piano or as a background melody to a piece you have played for years. Currently this instrument is available in a rich rosewood finish that can be purchased for about $1700 on Amazon. With the DGX650B digital piano, Yamaha has once again proven its exceptional ability to craft top of the line digital pianos. This piano has a large number of features that make it one of the best pianos for beginners who are just learning to play. It offers an incredibly interactive experience that makes learning the piano and sharing your music a fun and rewarding experience. In addition, weighing in at around 84 pounds, this piano is a great portable option for musicians who are often on the go. 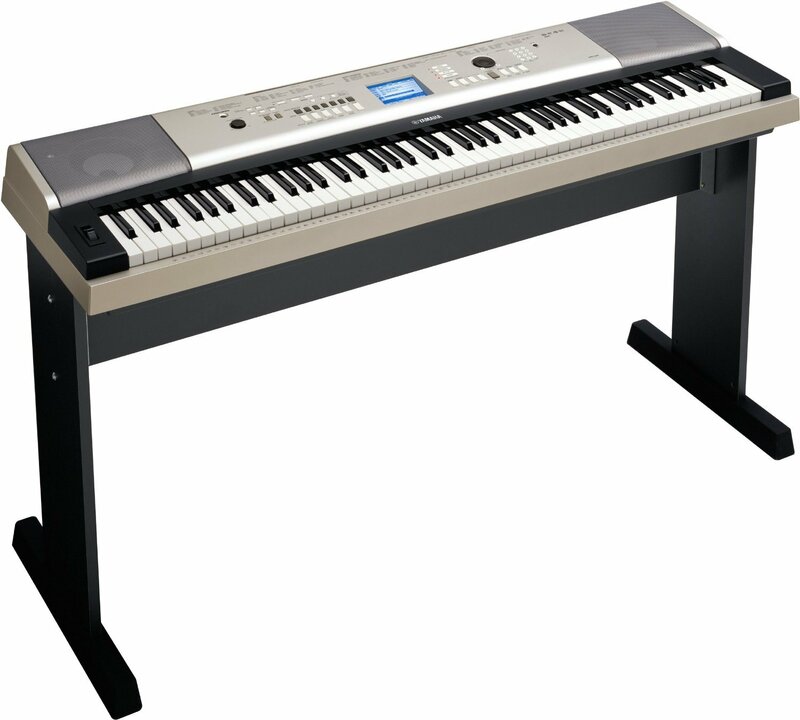 This digital piano has an 88-key fully graded hammer keyboard that is weighted for responsive play, which resembles the experience of a grand piano. Unfortunately, this piano does not come standard with pedals, but if you are an experienced piano player who requires this functionality, it is available as an added feature. The speakers in this specific instrument are exceptional. They are stationed in an area that ensures high sound quality and note clarity. This speaker system is comprised of separate tweeters and woofers to ensure that the bass notes do not sound muffled. In addition, the dynamic control of this system clarifies the treble to make brilliant sound combinations. Our runner-up digital piano has a polyphony of 128, which means that the piano can accommodate beginners and advanced musicians alike. This piano has some of the best sampled sound on our list. Yamaha meticulously recorded the beautiful sounds heard on this instrument from their elegant CFIIIS concert grand piano. No other digital piano brand in this category has sound quality on the same level as this instrument. This digital piano has the capability of recording up to five songs, each of which can be a combination of up to 30,000 notes each. The smart chord system is a digital accompaniment feature that is built-in to provide a background band as an underlay for the main solo that you are playing. This piano also provides more than 100 preloaded rhythms that vary in style from jazzy tones to some of the more electronic beats found in a night club. In addition, a style recommender creates a list of background tones that fit your play style and rhythm. The piano includes a full LCD monochrome display with the resolution of 320 x 420 pixels. The display can provide information such as lyrics to a song or display the score of the song that is currently being played. The display has an excellent contrast, which makes sight reading music a cinch. A great technical feature of the DGX650B is that it has the capability to connect any mobile device, mixer, or an additional keyboard through the AUX line input, which means that the device that is connected can be heard through the internal speakers of the piano as well. Finally, this piano has a USB slot that makes recording and sharing your music a simple task. This top of the line digital piano comes with around 500 preset songs for your learning convenience. In addition, the “You are the Artist” series includes songs and the sheet music for professionally arranged pieces from artists such as Adele, Elton John, and Taylor Swift. Currently, this digital piano is available on Amazon for about $800 in a black or white finish. When it comes to our third selection on this list, Yamaha once again proves its reliability as one of the leading creators of exceptional digital pianos. This piano comes in at a very affordable price point without sacrificing the quality we all have come to expect from the Yamaha brand. The Yamaha YPG is a great instrument that is suited for a beginning pianist who wants to purchase a keyboard that will grow with them and be their go to piano for years to come. Since transportation is a main concern for many musicians, this is a great digital piano to soothe those concerns. The instrument itself is only 38 pounds, which means that it is light enough for almost anyone to carry up a flight of stairs. Even the lightweight structure does not diminish the exceptional sound quality of this digital piano. The Yamaha YPG features an 88-key soft grade touch keyboard that is designed to have different levels of resistance for each key. It also features a 32 note polyphony to allow for brilliant note sustainability as well as a 16 part multi timbrel to play up to 16 different parts at one time. This digital piano is fashioned with a four speaker sound system that is designed to play with the same power and clarity of a grand piano. In addition, the Master EQ feature allows you to completely customize your sound. When it comes to recording there is nothing better than having a myriad of options at your fingertips. This digital piano has a six track sequencer that allows you to record multiple music tracks at once to create more sophisticated compositions. A built-in song arranger is another nice feature that will make recording and remixing your music a cinch. The digital effects of this piano are amazing. There are nine different reverb setting to accommodate any room size, which can range from a small studio to a large auditorium. There are about 26 different harmony settings to accompany your music, and more than 125 different voices to choose from. The voice options range from the natural expression of many acoustic instruments to the electronic sounds of other instruments. It also features a mode that allows you to play with amusing sound options such as a telephone tone or the sound of a barking dog. In addition, there is a split mode that allows each hand to play using a different voice. This digital piano features a backlit LCD screen that completely removes the need for traditional sheet music. Yamaha’s Lyric, Chord, and Notation Display is a great tool to utilize when you are experimenting with a new song. This technology is capable of pulling music notation from songs on the internet and even songs you create on the piano itself. This feature provides a great way to record, share, and write music for beginners and experts alike. Two USB ports are also included, and any song that is accessed through a USB port can be uploaded to the digital piano with the lyrics and the score included. As previously mentioned, this digital piano is a great instrument for beginners. It features a metronome to help you keep in time with the background beat as well as an educational technology called the Yamaha Education Suite that is designed to help teach beginners. The YPG comes with over 100 song options for learning purposes. Each lesson is separated into right and left hand techniques to help you with your tempo and your accuracy. In addition, a lesson grading program will help you progress and monitor your advancement. Currently, the Yamaha YPG is available in a silver finish for about $500 on Amazon. You may also find here another reviews & guide about the best digital piano under $500 reviews. For those who do not wish to spend a lot on a piano for a beginner, the Williams Legato Digital piano is a near perfect choice. This 88- key digital piano features all of the properties that a fresh pianist needs to start their career in music making. As the only selection on our list that is not a Yamaha instrument, the Williams Legato shines for its uniqueness and staggeringly low price point. This piano is a lightweight option that is extremely portable and easily maneuverable for teenagers and children who are learning to play. It is only about 50 inches wide and three and a half inches in height, which means that this digital piano does not come with a stand. Since the piano only weighs about 19 pounds, it can easily be placed upon a flat surface such as a desk or a table top. Also, due to the conveniently low weight of this instrument, hefting it from room to room can be done with relative ease. In addition, this is the only digital piano on the list that is only powered by batteries. It adds portability, but you may need to carry some extra batteries around just in case. If you desire a power cable, it must be purchased separately. This 88-key digital piano features a simulated weighted keyboard which gives key resistance to mimic the feel of a grand piano. It features a 32 note polyphony as well as a built-in metronome to assist beginners with keeping time. 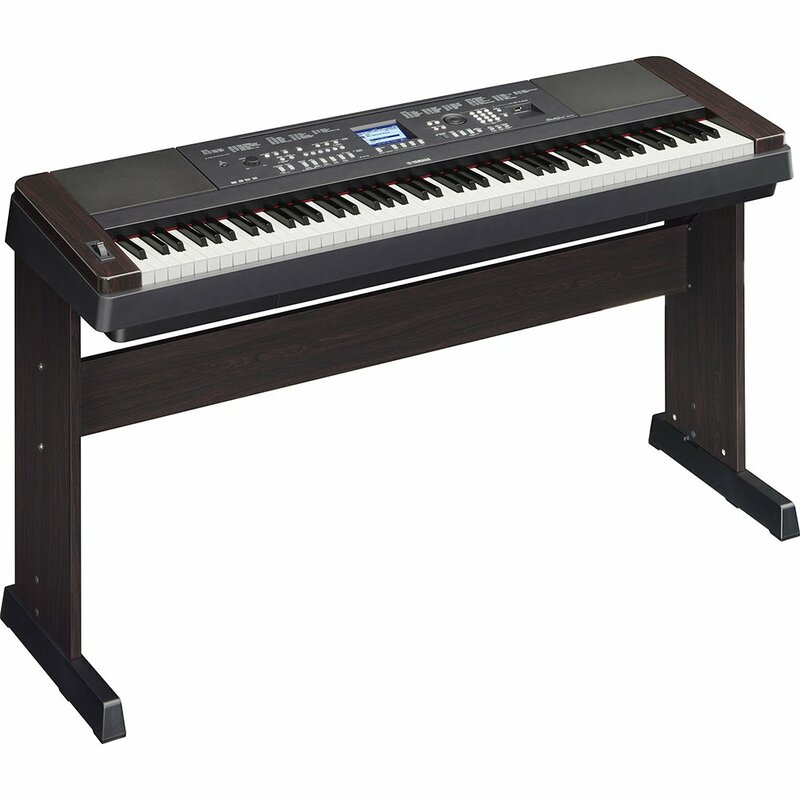 This digital piano features four built-in speakers that sound crisp, especially when considering the low price point. With this digital piano, Williams has also included five uniquely rich voice tones, which are piano, electric piano, organ, synth, and bass. It also features a split mode that allows each hand to play in a different voice or at a different volume. Insofar as connectivity, the Willams Legato has stereo and mono line out jacks. It also has a USB MIDI connector that provides connectivity to a number of music devices and programs that can be utilized to learn piano faster. To keep the price low, Williams decided to forgo adding any recording features to this model. This digital piano is available on Amazon with a black finish at a very affordable price point of about $200. Polyphony is the actual amount of notes or voices that can be heard at one time on a digital piano. This is important because if there is not an adequate enough amount of polyphony on the piano you purchase, then the notes can be cut off and replaced with newly pressed notes instead of being sustained. The keyboard response is also imperative to consider. It is important to be able to play the keys with ease and not be forced to press the keys with excess strength to get the sound you desire. To fully simulate the feel of a concert piano, lighter notes should be easier to press and deeper, while bass notes should offer a bit more resistance. Are you going to be traveling with your new digital piano a lot? Do you have gigs that will require you to heft the equipment up a flight of stairs? If so, then you may want to have a lighter instrument that is easy to transport. Also, when it comes to portability, set up times should also be a consideration. Make sure that the digital piano you choose for travel is easy to set up and configure. Additional attachments like pedals and exterior speakers need to be considered as well. Sound is of great importance when selecting a digital piano. Are you looking for tones that are reminiscent of a grand piano or do you wish to have a wider selection of electronic options? Make sure that the piano that you select has all of the voice options that you desire. If you select something with limited options, your piano will not grow with you as you learn to play. Eventually you will be unhappy with the quality of the music you can create, and be forced to purchase a digital piano that is more versatile and suited to your musical inclinations. On our list, there is a wide range of choices when it comes to voice and tonality. One piano samples a CFIIIS concert grand piano and offers a grand scale of digital voices, while another can simulate traditional acoustic piano sounds or even unorthodox sounds like animal noises. There are a myriad of choices, so be sure to select the digital piano that will best suit your musical needs. Not every digital piano has the ability to record, and the amount of storage available can vary greatly in each. Some digital pianos are designed to be a low cost option, so they may not be capable of recording in more than one voice; in fact, some may not have a recording option at all. Other pianos are designed for creating and sharing your own compositions, so they may be able to record a number of different voices at one time. When searching for an adequate digital piano, consider your level of skill, your desire to compose, and your desire to share your art as needs tend to vary based on individual skill level. A beginner may want more learning tools than an experienced pianist, so make sure that the piano you purchase has the tools you need. A built-in metronome can be a great tool for anyone who has trouble keeping time, but it is more beneficial for a beginner. Some digital pianos take what you are playing and record the score for you to review at a later time. This is a great way for someone who is not accustomed to reading music to see their art produced visually. Some digital pianos come with software to help encourage new pianist to learn specific songs. These programs explain how to play each song, while explaining finger movements and the different techniques to use for each hand. In addition, some programs offer a feature that allows you to track and monitor your music as you progress. The world of digital pianos is a growing realm that many musicians are venturing into. As technology increases, the vast number of features offered by many digital pianos are often more appealing than a beautiful grand piano that does not have as many voice options. The elegant beauty of a grand piano is often saved for theater and more orchestral settings; whereas the digital piano can produce nearly the same level of symphonic quality while still being able to produce the jazzy tones of a night club.